I’vc been lucky enough to see the International Space Station (ISS) pass over the UK a few times. Once you know where to look and when it’s quite easy. But until now I have never photographed it. I recently upgraded to a Panasonic GF1 Micro 4/3rds camera (more on that later) and so, armed with some advice about the best exposure settings I planned to try a photo. I follow @twisst on Twitter. They send you a Tweet each time the ISS is scheduled to pass overhead of the location you have set in your Twitter profile and so this evening I was forewarned that it would be visible at 17:33. So I grabbed my camera and tripod and set up. Typically I had forgotten to switch off Auto Focus and so, by the time I had the settings correct it was already half way across the skies. Even so, it turned out OK and I’ll set up earlier and make sure I’m better prepared when it passes over again tomorrow. 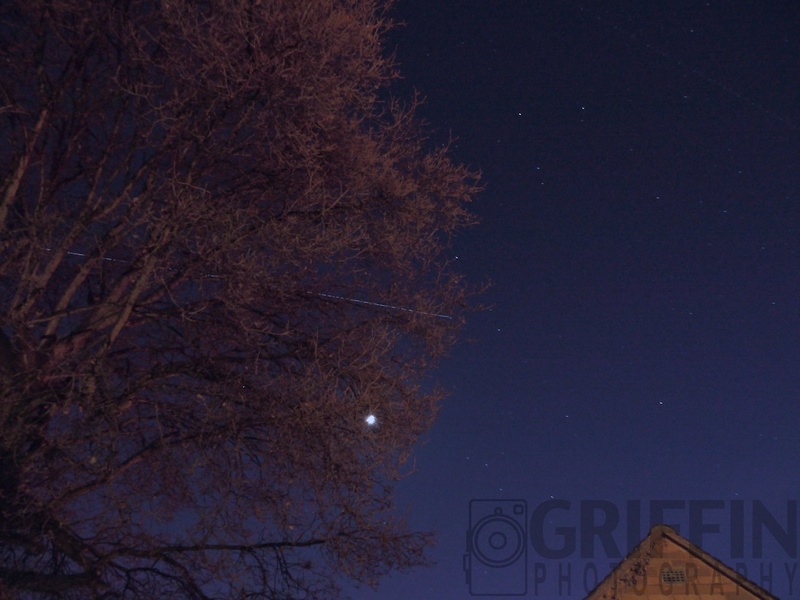 In the image below, using a 40s exposure you can just about see the trail of the ISS as it passes behind the tree. That is fantastic! SO where do I look>? If I am facing west in my garden, where do I gaze to try to see the station? It would normally come from the W or SW depending on its particular orbit. It’s quite obvious once you know what to look for, a bright star that moves cross the sky at speed. If follow http://www.twisst.nl/ on Twitter – They send you an @ Tweet when it is due over your locale and give you the direction to look.